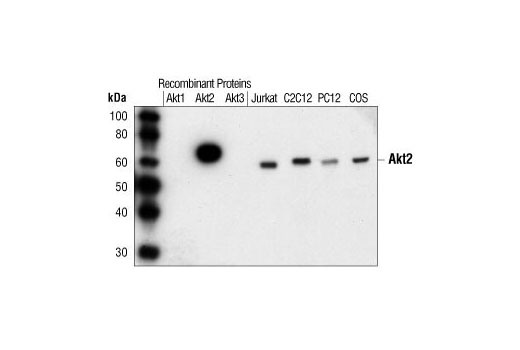 Western blot analysis of Akt1, Akt2 and Akt3 recombinant proteins, and extracts from Jurkat, C2C12, PC12 and COS cells, using Akt2 (5B5) Rabbit mAb. Akt2 (5B5) Rabbit mAb preferentially binds to non-phosphorylated endogenous levels of Akt2. It does not cross-react with recombinant Akt1 or Akt3.